Turkeys are perfect for Thanksgiving! 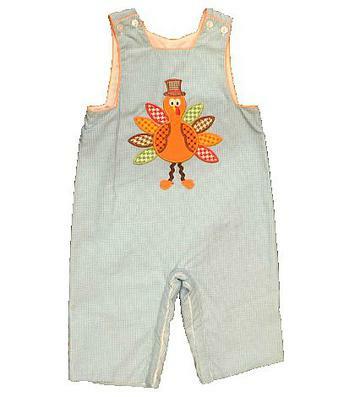 This turquoise and white mini check long jon jon has a large turkey applique on the chest. The arm holes and neckline have an orange and white mini check piping around them. There is two button on each shoulder to get on/off easily and snaps on the inside of the legs to accomodate diaper changes. This soft outfit is 55% cotton and 45% polyester and would pair perfectly with a white or brown turtleneck.